A photo at http://www.rsgyc.ie/gallery/CruiseToFrance/pages/Richard%20Hooper.htm shows the RSGYC actually flies an Irish Yacht Ensign (possibly defaced with the club badge although not identified on our page). Also used for the Royal Windermere Yacht Club. If I'm not mistaken I believe we collectively agreed that the Windermere ensign also once served the Royal St. George Yacht Club in Ireland. The crown was moved to the fly in 1895, so a Tudor crown would not have appeared in the Union canton. As I understand it, the crown appeared in the Union canton until 1895. I assume, therefore, that this would have been the Victorian crown with the "flat" arches. In 1895, this crown would have migrated to the fly and would have been superseded by the "Tudor" crown in 1902 or so. This, in turn, would have been replaced by the current St. Edward's crown in 1952 or thereabouts. I assume, too, that this is still the position today. Does a modern Irish YC really fly a defaced Red Ensign? Not only is that implausible for political/national pride reasons, I would have thought that it would also be illegal, since the yachts presumably would be Irish registered. Or would the defaced Red Ensign be a purely ceremonial/historical flag and never used at sea? A member of the Royal St George Yacht Club who is British and has a British registered yacht is entitled to apply for a special British ensign, in this case a Red Ensign defaced by a crown on the fly. The R St. George YC is listed on the Navy List as being eligible to have its qualified members apply for warrants to fly the Red Ensign defaced with the club badge, which is the Royal Crown. As with other British special yacht ensigns, the club member must own a British-registered yacht. While this may seem to be an unlikely situation for a club situated in a country outside the Commonwealth, given the provisions of the Republic of Ireland Act, 1949 (UK), there were greater opportunities for citizens of the Irish Republic to access the British register than others as they were still accorded privileges of Commonwealth citizens. So access to the British registry by Irish members would not be unknown, and any such yachts would wear British colours. Of course, this is not to deny the existence of the Irish register and its predominance among the Irish; the British register is simply an option. In addition to the British ensign, the R St. George YC ("the George") has adopted (perhaps been granted by the Minister of the Marine) an Irish yacht ensign, which is navy blue, with the Irish tricolour in the first quarter, and with a depiction of the Crown in red in the fly. This is an Irish version -- albeit in blue, not red -- of the club's special British Red Ensign. The samples I have seen depict the Crown in a solid red colour (not in its full natural colours, as it is on the British ensign), but otherwise, the pattern of the two flags resemble each other. If I am reading their history page correctly, www.rsgyc.ie/about/history/default.asp, the image here is the yacht ensign of the Royal St. George Yacht Club. The Dumpy Book of Ships and the Sea (1957) shows the burgee red with a white cross, with a crown over its centre. 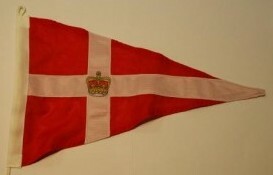 “the Burgee was red with a white cross with a crown at the centre. This, of course, is the St. George's Cross, and is quite possibly the reason why, in 1847, the Club became The Royal St. George's Yacht Club, although this has never been established”. Inverted colours, though. Graham Bartram shows a Tudor crown, logically the previous version, whereas the club offers the item with a St Edward’s crown (near end of page): http://www.rsgyc.ie/social/shop. Both crowns fit neatly into the centre of their crosses in contrast with, for instance, the 1923 edition French Album showing shows a more prominent item, the 1928 German Flaggenbuch less so. The note “This ensign is sometimes made with a navy blue field” is of course very appropriate as such a version may be seen on the photo gallery (Christopher) links to, see under “Club Staff Party 2010 – 14th June”. Alas, the fly end remains hidden: http://www.rsgyc.ie/images/uploads/DSC01738.JPG?PHPSESSID=1beef2a55398434bd38a5c07068b2af6. The various galleries may hide a good picture of the current Irish ensign – to be explored, but in the meantime this screenshot from http://www.pixelated.ie/news/detail/royal_st._george_yacht_club shows a dark blue field, St Edward’s crown in natural colours.